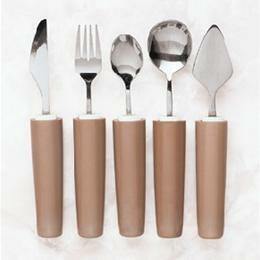 Stainless steel utensils feature handles designed for hands with limited grasping ability. Lightweight, soft and contoured – will not irritate pressure points. Handles have a soft, rubbery, non-slip surface. The Rocker Knife allows single-handed cutting of foods with a rocking motion, Dishwasher safe.